The A560 features a 4X (35-140mm in the 35mm format) f/2.6-5.5 all-glass aspherical zoom lens. When the camera is powered down the lens is retracted inside of the body and a built in shutter closes to completely protect the lens. Macro - 2.0 in. (5cm) to 1.5 ft. (45cm) in wide angle and 1.1 ft. (33cm) to 1.5 ft. (45cm) in telephoto. In low light conditions the focus-assist lamp helps to illuminate the subject for accurate focusing. Unlike past models, the A560 is not compatible with auxiliary Canon lenses. The built in flash offers Auto, On, Off, Red-Eye Reduction On or Auto. Flash range is 1.5 ft. (45cm) - 11 ft. (3.5m) in wide angle, 1.5 ft. - 7.2 ft. (2.2m) in telephoto or 1.0 ft. (30cm) - 1.5 (45cm) ft. in macro mode (in wide angle). This is a Light-guide zoom flash that changes its angle according to the lens' focal length. The AF-assist lamp also serves as a red-eye reduction lamp. Compact and elegantly designed, the optional High-Power Flash HF-DC1 complements your PowerShot perfectly and requires no accessory shoe. With a strong light output (guide number 59 ft.) and wide angular field (28mm), it delivers proper illumination up to approximately 30 feet and in all zoom positions. The flash fires in synchronization with the main flash, and output is adjusted accurately and automatically. A "Manual" mode prevents others from firing your flash. You can frame your pictures with the color LCD or to save precious battery power you can use the optical finder. This is a coupled viewfinder with approx. 80% to 85% coverage. It has no dioptric adjustment. Next to the finder are two LEDs that indicate the flash and focus status. On the top you'll find the On/Off button, the shutter release with the zoom lens control mounted around it. In playback mode the zoom lever functions as the index and magnified image control. The Mode Dial with positions for: Auto, Manual, Portrait, Landscape, Night Snapshot, Kids & Pets, Indoor, Special Scene (Night Scene, Foliage, Snow, Beach, Fireworks, Aquarium), and Movie. See the next page for more information about the various Record modes. The Powershot A560 features a large 2.5-inch LCD with 115,000 pixels of resolution. It is used for framing shots, reviewing stored images as well as menu operations. Controls on the back: At the top right is the Play / Record switch. The Print/Share button speeds and simplifies printing to Direct Print and PictBridge compliant printers, as well as transferring images to your PC. The 4-way controller lets you navigate menus and select images during playback, the FUNC./SET button accepts menu selections, In record mode you press "Up" to change the ISO, "Right" for flash modes, "Down" to choose the Drive mode or delete an image in playback mode, and "Left" to use the Macro focus mode. The FUNCtion/SET button gives you access to the Function shortcut menu. This gains access to many settings (white balance, My Colors, image quality and image size.) The DISPlay button turns the color LCD on/off and controls the amount of data displayed on it. The MENU button calls up and dismisses the menu screens. The I/O ports: AV Out handles monaural audio and video to connect to a TV set with the supplied cable. The DIGITAL port connects USB 2.0 (high-speed) to the computer for download and camera control with the RemoteCapture software. It also allows for Direct printing to any PictBridge compatible printer, Canon Card Photo Printer or Bubblejet Direct photo printers. DC INput jack for an optional AC power supply. The Powershot A560 is equipped with a card slot that supports use of SD or MMC cards up to 2GB or SDHC cards 4GB and larger, it comes with a 16MB SD. Shown here with a Lexar 1GB SD card - see the tables below for the approximate storage capacity. The A560 can be powered by two standard AA-type batteries, alkaline, NiMH (nickel metal hydride), or lithium cells. Canon claims with AA Alkaline batteries you can capture approx. 140 shots (LCD On), and 540 minutes of continuous playback time. With NiMH cells Canon claims approx. 500 shots (LCD on), and 660 minutes of continuous playback time. Check out our NiMH rechargeable battery page for more info on NiMH battery types. A user-replaceable CR1220 lithium "watch" or "coin" battery retains time, date and camera settings during main battery changes. 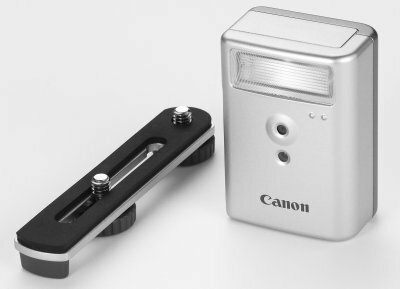 Canon also offers a battery and charger kit CBK4-300 that includes both a charger unit and four rechargeable AA-size NiMH batteries. The A560 can also be powered by the AC Adapter Kit ACK800 for unlimited runtime from your wall outlet.